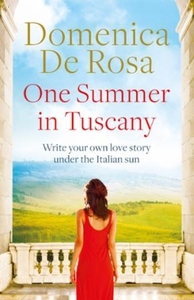 Rivalries and romance in a Tuscan paradise. A relaxing writers' retreat? If only! Perfect holiday reading from Domenica de Rosa, author of the bestselling Dr Ruth Galloway series under the name Elly Griffiths. Previously published as SUMMER SCHOOL. Patricia Wilson's carefully composed ads for the writers' retreat she runs at her thirteenth-century Italian castle promise so much. But while the splendour of their surroundings and chef Aldo's melanzane never fail to wow the guests, huge maintenance bills and bad news from the bank threaten to close Patricia down. It's make or break time for the Castello. Each of her seven aspiring authors arrives with the inevitable baggage alongside their unpublished manuscripts. But this August something is different, and soon lifelong spinster Mary is riding on the back of Aldo's vespa, and smouldering odd-job man Fabio has set more than one heart racing. As temperatures rise, the writers gossip, flirt and gently polish their prose by the pool. But with ghosts, scorpions, and some unexpected visitors to contend with, one thing's for sure: neither the Castello, nor Patricia, has ever seen a summer like this.